The British 49th (West Riding) Division had bled the 12th SS Panzer Division “Hitlerjugend” dry in heavy fighting over the last two days of Operation Martlet, but had been unable to find a way through the rugged defence. With light drawing down on the second day they prepared themselves for a final attack on the German line to the south of Fontenay. The ruins of the farm at St Nicholas bore the scars of previous British attempts to drive back the Germans, could they finally take their objective this time? The Germans have a 19-man platoon and 10 points of support available. Feeling flash they whacked the whole support budget on a Panther, hoping to bag some Allied armour. They’ve also still got their Panzer IVG. This being the last game for the British they sent in their second platoon, who were obviously at full strength. British force morale was maxed out at 11, with the Germans starting on 9. This is ground very familiar to both sides having been fought over several times before (here, here, and here). Again, the centre point of the German defence would be the farm compound, the main difference now being that the last attack on it had reduced both of the stone buildings to rubble when they came under sustained demolitions fire from an AVRE, and British engineers had also blasted a large hole in the wall surrounding the compound. The farm was pretty much demolished by the Royal Engineers in the previous game. Both stone buildings are in ruins, and the surrounding wall has been breached. This left the compound easier to assault than before, but the only approach to it remained the orchards on one side of the road, with the wide open fields on the east side remaining a killing ground for men and tanks alike. The British had already lost the campaign, the only thing this game would decide is whether the German victory was marginal or decisive. So I decided to bring up loads of tanks and have a bit of fun with it. 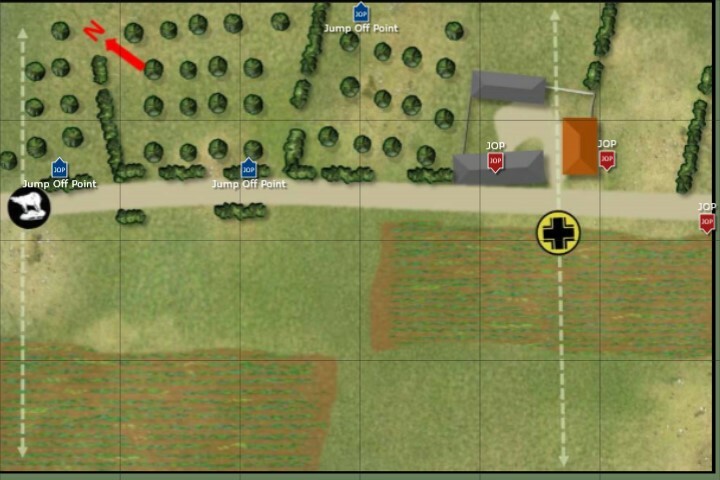 The platoon of Shermans had orders to clear any supporting armour and AT guns, then support the infantry attach on the farm compound with their main guns. The mortars would keep the German infantry until the tanks were ready to offer their support. The Germans kept their heads down for the first few phases as British infantry infiltrated into the orchards. As two sections moved towards the German lines a Sherman tank grumbled up behind them in the trees. As the British infantry neared the walls of the farm a German squad went onto overwatch in the ruined farmhouse, with their officer deploying slightly to their rear behind the building. The large breach in the farm walls gave the British easier access than they’d had in previous games, but a second squad of Germans deploying into the ruined barn and watching the gap proved to be an effective stopper. A British section moved up to the gap, but held off advancing into the face of two MG42s until their support could be brought up. Sensing the hesitation in the British attack, the Germans sprang an ambush. An MG42 team popped up out of nowhere and hammered the right hand British section, but the burst of fire sailed wide and only inflicted a point of shock before the gun team pulled back. The Sherman tank was still slowly picking its way through the orchard, and obviously it had been heard by the Germans, who may have been expecting the return of the deadly AVRE. Their tank ace decided to go hunting, and rolled onto the table in his Panzer IV. At that, all hell broke loose! A PIAT concealed in the hedge fired off a shot that landed short of the Panzer, sending a column of dirt flying. Then a huge bang and a flash from down the road signalled the arrival of a 17pdr Sherman; the shot struck the German tank and took a chunk out of the armour by the driver, panicking him. Then a smaller bang from closer nearby came from the 75mm Sherman, which also hit the Panzer IV, wounding the commander. The German tank was still in the fight, but two good hits had put it on 3 shock, close to bailing, and the Germans had suffered their first chip off their force morale. All this just meant the Germans had the British armour right where they wanted them though, and the Allied tankers noticed with alarm a huge shape appear out of the smoke and dust by the Panzer IV. Shots ranged out from both the smaller MkIV and the monstrous MkV Panther, but some incredibly poor luck saw both miss the Sherman VC by a mile. In reply, the British PIAT reloaded and hit the Panzer IV this time. The shot didn’t penetrate, but was enough to panic the already badly rattled crew, they reversed off the table and bailed out of their stricken mount. With one German tank down, the effort now focused on the Panther, which would be a much tougher nut to crack. Realistically the only thing the British had that could hurt it head-on was the VC, which fired again and got a solid hit on the Panther, obliterating the driver. The 75mm Sherman joined in, but couldn’t hurt the well-armoured German beast. Lacking an intact driver didn’t seem to faze the Panther crew too much, as the gunner lined up the VC and fired a round into it from the high-velocity German gun. It smashed through the light armour of the Sherman and killed the 17pdr gunner in his seat. The British tank slewed left and roared into the orchard to get out of the line of sight of the Panther while they remanned the gunner’s position. This left the 75mm Sherman facing the Panther alone, but it was saved when the nearby 2″ light mortar helpfully dropped a smoke round right in front of it. While all this tank action had been going on the British infantry had been holding their position short of the farm. Their mortar observer had come forward and after a couple of ranging shots managed to put one right on the spot he was aiming for: the chimney of the ruined farmhouse. The initiative had now swung in favour of the Germans though. With both British tanks scurrying for cover and the infantry waiting for their mortar stonk the Germans elected to go and grab the British by the belt buckle. A small gun team of four men dashed up the road, with the giant Panther replaced its dead driver and roared alongside them, throwing up clods of French dirt as it came. The Panther fired some HE into the orchard where the British infantry waited and killed one of the PIAT crew. The PIAT returned fire at the big cat (well, why not?) but missed. British hopes rested on the 17pdr VC, which had managed to replace the dead gunner but was slow to get back into firing position. More HE from the Panther landed in the orchard, and this time three squaddies were hit, including the remaining man on the PIAT. This quick thrust by the Germans was bold, but British spirits were buoyed somewhat by the sudden arrival of a barrage of 3″ mortar rounds all over the farm compound to their front. This cut off the Panther and MG team from reinforcements but they still had to be dealt with. Luckily for the British their Firefly tank struggled back into view of the Panther, and was lining up a shot to stop the beast dead. Unluckily, the Germans got the shot off first, thanks to canny use of an interrupt by Phil. The Germans’ aim was true, and it smashed into the flimsy Sherman, which clattered to a halt and began spewing smoke. The hatches popped and the Sherman crew jumped out to safety. This was a massive blow to the British, as the Panther would now be extremely hard to stop. The 75mm Sherman withdrew into the orchard and safety, while its twin finally deployed a little to the rear. About the only hope with the 75mm Shermans was to work as a pair and try to get a flank shot. As the mortars rained down on the farm though the Panther was having none of that, and crushing the hedge it rolled into the section of orchard with the British infantry in it. This galvanised the waiting troops into action, one section dashed towards the farm wall to their front, while the other changed past the Panther, hoping to get out of its line of fire. Rolling a bit too enthusiastically on their movement dice they ran past the tank and bumped straight into the 4-man gun team! A short, vicious firefight broke out during which two Germans fell (one of them the NCO, knocked unconscious by a vicious ET blow to the head) but three Tommies were hit, including their own section commander. The British recoiled a short distance. Things were now looking desperate. Both sides had taken several knocks to morale, with the German force consistently tracking a point or two below the British. The British infantry were caught between their own mortar barrage to their left and the Panther on their right, and their punch to the front had just been thrown back. The Panther added to their woes by spotting one of their remaining Shermans in the orchard and blasting it with a single shot. Gouts of flame and smoke followed the Sherman crew out the hatches as they dismounted. The infantry platoon commander decided to double down and personally led both his sections in another bayonet charge on the German MG position to their front. This time the weight of British numbers was decisive, wiping out the survivors of the first charge, but again at the cost of more British lives. The loss of a team and an NCO cost the Germans more force morale, but the tank losses on the British side meant they were only on six to the German four. The Panther looked like it was going to clean up all opposition, but the sole remaining Sherman had a final card to play. It moved down the road and managed to line up a flank shot on the big panzer. If it could pull off a good shot the kill would really swing the tide against the Germans. Repeating his earlier move though, Phil burned another CoC dice and interrupted the British phase. After a bit of jiggery pokery with bits of paper and a consultation of the rules wer decided the Sherman was just inside the 120° arc that would let the Panther traverse and shoot the Sherman. So shoot it it did, and the last Sherman died before it could get its lovely flank shot off. It was do-or-die time for the unsupported infantry now, and with a German squad just around the corner in the ruined farmhouse the lieutenant launched another reckless charge through the rubble and into the enemy. This squad was fresh, having only traded some ineffective fire with a nosy Bren gun that had snooped around the breach in the farm wall earlier. This was going to be bloody, and when the buckets of dice came to a halt all there was one German survivor from the squad of seven (the junior leader being killed in the fighting), German morale slumped further to two points, costing them a Jump Off Point. The cost had been high though, the British officer was also killed leading the charge, the British lost the fight (six kills to eight) and only six men staggered back along the road, one of them a badly wounded corporal being carried by one of the privates. The German defences had been savaged by all these attacks, and the defence now consisted of one intact six-man squad, the platoon’s officer, and one pinned survivor in the ruined barn. But let’s not forget the Panther, which now reversed back over the hedge towards the shattered British infantry and tried to crush them. Luckily for them they managed to dodge out of the way of the beast’s tracks, but in the next British phase I took stock of the damage. Two sections had been nearly wiped out and the platoon commander was dead, but there was another section and the platoon sergeant still in reserve. Force Morale circled the drain though on two. The Germans also only had two points left, but crucially the scenario rules for Attack/Defend state that the attacker has to keep their own morale above three to claim a victory. This meant that the best I could hope for was a draw, which wasn’t enough. The retreat was sounded. The farm at St Nicholas would stay in German hands, and Operation Martlet had failed! Desperate fighting in the dying light of Day 2 of Martlet, and heavy casualties on both sides. The British lost their officer, one of the corporals and six dead, four wounded among the men. The Germans lost two NCOs and three ORs dead, with two wounded. If there had been another game in the campaign the Germans would only have 11 men, including one officer and one NCO to hold the line. True to life, the Hitlerjugend had fought tenaciously, but their losses had been savage. Among the tanks crews it was one dead apiece, with an unknown number of others wounded when the one German and three British tanks were knocked out. Well, that’s a decisive victory for the Germans in the campaign. The British will have their backs to the wall in the Scottish Corridor. Again, all the infantry action stopped as soon as the tanks arrived. Multiple AFVs consume a lot of command dice while fighting, so the infantry attack stalled while that was going on. With hindsight I realised I could possibly have threatened the ruined barn from both sides instead of attacking en masse from one side. I would have had fewer bodies for the assault, but would maybe have faced only one MG in hard cover, which would have been 6d6 fewer dice on the German side (LMGs only count in close combat if they’re facing you when you attack). The Panther was a game-winning support pick from Phil. It ran rampant through my platoon of Shermans and once my 17pdr was gone it was an unstoppable force, which really limited my infantry’s options. Great campaign Andy, I really enjoyed it. Thank’s very much. It was also the most difficult wargame I’ve ever played. Looking forward to the Scottish corridor …………… no mortars and plenty of Tiger tanks !!! Sure, but if I manage to delay you long enough I get the A-bomb, right? Looking forward to swapping roles for Scottish Corridor. This time you can do all the attacking! Ouch, that Panther really dominated the game! I don’t blame the poor bloody infantry for being cautious moving about with that beast lurking around lighting up Shermans left and right. as always fantastic! Looking forward to the Scottish Corridor. Great AAR Andy, I hope one day to start playing some of the campaign games. Do it John! It completely changes the way you play the game (very much for the better). We very rarely play CoC outside of a campaign these days. Agree Andy, after following your excellent AAR it does bring a new dimension to the game.